“Hope is now here,” she said, and the room seemed to voice a collective epiphany that suggested: Yes, she is right! It’s supposed to be a positive message, not a negative one!! I then remarked, “I suppose that makes me a raving pessimist!” And I received a moderate chuckle from around the room. But, ultimately, the instructor said he was glad I answered the way I did because it played perfectly into his lesson. He told us this: That we always needed to keep in mind that our “customers” (cabinet officials, congress persons, and other policymakers) bring certain biases to any document that they receive in written form. 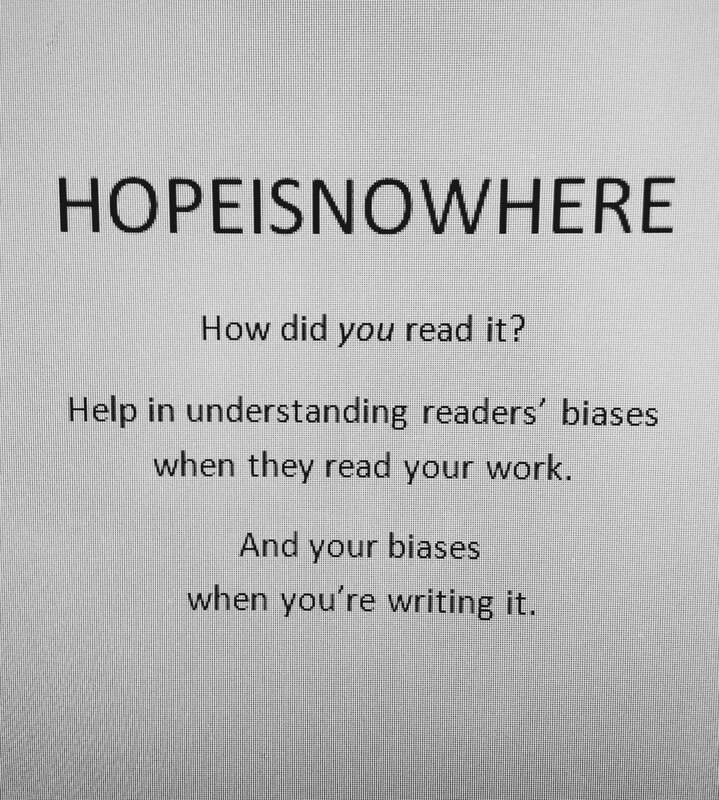 And what’s more, we bring certain biases to our work on the front end, when we are researching and writing. It’s human nature. So he implored us to remove our biases as thoroughly as we possibly can. To look at what we write from every angle we possibly can, and to be as clear as possible with what we intend to convey. I could write a thesis on how the writing process in the context of intelligence analysis differs from creative writing, but it suffices to say they differ greatly. Yet some axioms benefit both forms without question. The choices we make in our use of language can either unfurl a seamless narrative that carries the reader along a journey from one point to the next with thrilling dips and dives that are as clear as day. Or they can twist things up in knots and confuse the reader to the point of delirium. We want to make our stories accessible to the most people possible. With that in mind, it helps to remain mindful of how different readers may approach our word choices, the organization of our plot points, and our various narrative devices that we use, so that our message is conveyed with optimized clarity. A hundred years ago when I was learning to drive, my father asked me why I was constantly looking in the rear-view mirror at the car behind us. He asked this for good reason. I was always attentive to the status of the driver that followed behind, probably over-attentive. Are they anxious to pass because I’m driving too slowly? Are they aware I intend to turn at the next corner? Have they seen my signal? Do they know I’m new at this?? Sure, in doing so I was probably being over-cautious and it may have affected my approach to something that I was doing, something important like driving, which requires us to project to those around us our clear intent in where we are going and how we plan to get there. But as I became more comfortable on the road, I developed instincts that helped me intuit the status of the driver following behind, and it made me a better, safer driver who was free to look forward and keep my eyes on the road, while only glancing from time-to-time in the rear-view. The same method may help us in our writing. At the outset of any project, we’ll want to remain attentive to the many ways that readers may approach our subject matter. The many ways, for instance, a character can be perceived for his or her actions, or the way a setting can be perceived for its mood and tone. Then once we’ve gotten comfortable in the space and have established a certain level of clarity in our work, we can look ahead and press forward with confidence. We don’t want to send mixed signals, or muddle a scene in such a way that might reduce its appeal to certain readers. For a creative writing course in college, I wrote a scene in a short story that took place on a warm, overcast afternoon with a light drizzle, and in the scene, a character benefitted from a particularly positive turn of events. When we talked about my story in class, a classmate shared that they’d had a conflicted emotional response to the scene, as the plot development was positive, but the setting was notably dreary and oppressive. Thinking on this, I realized I may be in the minority when it comes to warm overcast days with a light drizzle; finding them to be actually quite cozy and enjoyable. So to me, the setting befit the plot development. And let’s face it, not every positive plot twist needs to occur on a bright, sunny day. Good things happen in real life on rainy days, right? But for many folks, a sunny (or at least more neutral) setting might have promoted a more unified, effective response to my scene. So for that reason, it would have been worth at least considering an edit for the sake of clarity. In some senses, this concept reminds me of a project concept I’ve always wanted to pursue; a bare-bones, almost starkly minimalist narrative that inspires (perhaps even requires) the reader to run wild with their imagination. I would strip away all the descriptive language. I would leave climate descriptors out completely, maybe even time of day, season, time period, and location, too (are we in North America? Europe? On Earth? In the Milky Way Galaxy even?) and I would let the reader fill in almost everything. I’d certainly leave out facial feature descriptors, non-verbal expressions, and definitely those italicized thought inserts where the characters spell everything out for you—which, by the way, I use liberally in my narratives; with a reasonable measure of restraint, of course! All these things, though, would be entirely up to the reader to fill in. As a result, I wonder how many unique visualizations of the same story would be formed. Probably just as many as there are persons who would read it. Hopefully I’ll find the time to give it a try some day. But this idea turns the process of bias awareness on its head. My point is, if we’re going to ignore readers’ biases (and our own), we really have to go all-in on the idea, and make it the central theme of our work–and an unconventional work it would certainly turn out to be. In all other circumstances, we need to be mindful of the many ways our narrative can be interpreted (and misinterpreted). Maybe I was having a bad morning when I provided my pessimistic reading of the instructor’s puzzle that day in Analysis 101. And if so, I suppose I’ll give myself a pass. The puzzle provided a great lesson in interpretive reading, and in that respect it succeeded. But if it’d been either the headline in an intelligence assessment, or the first sentence in a fiction narrative, it would have failed miserably.